It's that time of year again. The approach of the mythical SoCal "offseason." For some, the offseason is a very real thing. Time to get away from the bike and recharge the legs and spirit. For others, this is the time of year when fitness gained over the summer is put to good use as the weather remains fantastic and the days remain lengthy. Whether you believe in the SoCal offseason or not, the coming months feature some of the most important happenings for our club. This month, we have La Grange Happy Hour, the Piuma Hill Climb, the Annual Club Picnic and board of directors nominations and elections. In November, we have our Annual Club Photo, Meals on Wheels Ride and the Annual Banquet and Awards Ceremony. So there is a lot to look forward to as we close out the year! You can sign up NOW for the Piuma Hill Climb by clicking here. Sign-up is of course free, but you do need to sign up in order to get a number and an official time. Registration will be open until Thursday, September 15th at 8PM. Numbers will be available at Peet's Coffee in Brentwood after the Friday morning Marina Ride from 8 - 8:30AM and at the start of the Hill Climb on Saturday morning at the base of Piuma from 8:15 - 8:45AM. Here is a link to the Strava segment if you don't already know the route. The race begins at 9am on Saturday, September 17th at the base of Piuma just off Malibu Canyon Road. We'll have further info in the next couple weeks, but for now sign up and get your climbing legs ready for Piuma! Our annual club picnic will follow the Piuma Hill Climb as in years past. Rick Friedman will once again be bringing an amazing catered spread, so plan on coming out to Rustic Canyon Park from noon-3pm and replenishing all those spent Piuma kilojoules. $10 - the club picks up the rest of the tab. Tickets will be available soon! There was an interesting post in a Facebook cycling group recently, admonishing riders not to ascend Tuna Canyon Rd. because it’s one-way downhill. Given the speeds, legal and otherwise, that a descending car or bike will quickly reach on this infamous stretch of road, climbing against the flow of traffic on a bike is courting disaster. The discussion was instructive because although many riders condemned salmoning on this especially gnarly stretch of road, many will admit to having done it. From there it became an admission that cyclists often break the law, especially at stop signs, and that there is a whole set of scenarios in which cyclists decide to abide by the law … or not. From a legal perspective, if you get hit by a car and you were salmoning, or running a red light, or running a stop sign, or making an illegal turn, and that illegal move played a substantial role in your getting hit, you will have an uphill battle—putting it mildly—to get compensation for your injuries. In other words, being in the wrong doesn’t pay, and you could very well end up liable to the motorist if you damage their cage or cause them pain, suffering, injury, or emotional distress. From a practical perspective, running stop signs, to name one common violation, can be totally safe. The Idaho stop is one attempt to legalize treating stop signs as yields, and red lights as stop signs for bicycles. What was interesting to me is that the Facebook discussion revealed the hostility that some cyclists have for other cyclists who flagrantly and regularly break the law. A whole bunch of cyclists are law abiding and expect others to be as well, for the sake of safety and for the sake of public perception. I agree that we should obey the law and that, same as when we drive, we won’t always achieve perfection. More importantly, I tend to subscribe to a “vulnerable user” theory of road usage. When I drive or when I ride, the more vulnerable user gets precedence. This means slowing way down on the bike path, where so many pedestrians and little kids invariably wind up. This means slowing way down when I see crazy bike antics and I’m behind the wheel of my cage. This means relaxing, chilling out, and not letting the scofflaw antics of someone else get under my skin. I’m hardly a perfect practitioner of the theory on my bike, let me add, but I’m an extremely good practitioner in my cage. Going up Tuna Canyon? Dumb, but many of us have done it. Slowing down for the vulnerable? It’s not that hard to do. Our next Happy Hour will be Thursday, September 15th. Where will it be held? We don't know yet! But that hasn't stopped 49 of you from saying you are definitely or maybe going in response to the Facebook event that was only very recently created. You people must really love your Happy Hours! Sponsor Seth Davidson will once again be there and will buy you a drink if you show up early enough. Stay tuned for further details! This one in among my favorite links so far, you can now replay your ride in 3D using www.relive.cc All you need to do is register and connect Relive to your Strava account and wait for your next ride to see the most advanced GPS tracking out there! The nice feature is that it takes into account your privacy zone radius if you have it ON so people won’t know exactly where you live. Also any picture you upload to your Strava ride will be displayed in the video. What a great ride! 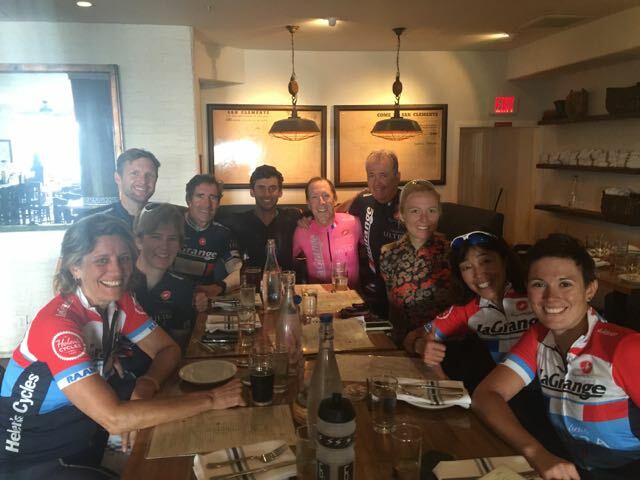 On Saturday, August 13th, approximately 15 of us did a La Grange organized/sponsored/hosted century ride from the Culver City Metro station to San Clemente. To be exact (according to my Strava), we rode 102.8 miles and climbed 3,228 feet, which is fairly flat for a century ride. I’m pleased to say, there was a nearly even split of guys and gals. A really great bonus to our ride was the luxury of Louis Bianco driving the La Grange van, sag supporting us the whole way. And I do mean luxury. The van carried our fully loaded backpacks. When we got thirsty, we stopped right where we were and refilled our bottles with icy, cool water and electrolyte drinks. You want a coke? Call Louis, there’s a cooler in the van. You want a snack? There are plenty of those, too, including Bonk Breakers, which were supplied by our great club sponsors Helen’s Cycles, potato chips, bananas, and licorice. Oh how La Grange spoiled us that day. Thank you, La Grange. We rode together the entire way. We waited together during rest and flat repair stops. We laughed, chatted and teased each other all day. We kept a decent pace. Some of us pulled, some of us didn’t. It didn’t matter. And, aside from some very minor wrong turns, we did not get lost, thanks to Rich Hirschinger’s excellent navigation skills. When we arrived in San Clemente around 3:30 pm, we were of course, hungry. Everyone was hankering for something. Beer mostly. So we headed to the cute little bistro across the street from the San Clemente Amtrak station. Although we wanted to change out of our kits, poor Louis was stuck in traffic on the 5 freeway. But there was not a grumble among us. We downed more than a few beers and ate a delicious lunch in our wet, sticky kits. No one cared. Eventually Louis arrived and, after loading all of the bicycles into the van for Louis to drive home for us, we changed and rinsed ourselves in the restaurant bathroom. After that, we took a peaceful, albeit fairly delayed, train ride back to Union Station, and them took the Metro to Culver City. A long day for sure. But a really lovely and wonderful day it was. Where are we going next time, Rich? Corral Canyon, Encinal, Mulholland, Latigo, Stunt, Piuma, 7-Minute Hill, Las Flores, Fernwood, Decker, Deer Creek, Yerba Buena, Westlake, Potrero and Rock Store. Your times are added up so you can compare your results on the Leaderboard. You can do the climbs as many times as you like to try and improve your ranking. I tackled this challenge for the first time this year and found it quite addicting. Saturday rides focused around new routes, leading me away from the typical routes we do. All of a sudden I wanted to do better and worked hard at improving my times. There were even a few pre-dawn attempts for Deer Creek and Decker on weekdays. Overall my climbing improved with this challenge and I pretty nearly PR’d every climb. Boy do my palms sweat when I line up to a Grand Prix with the Big Boys. What am I doing here, why am I not riding in the hills? I see Josh Alverson of Surf City a few rows over and call out to him: “Send me and eVite” – he smiles back. The whistle blows and the road echoes with the sounds of clipping in and much needed gear changes. The peloton surges, trying to set a pace that it can’t sustain, to see if there’s any interest in breaking it up. Nothing. We turn the hairpins as one and the peloton settles in for the long haul. Within 5 minutes I’m at the front, doing what I not supposed to do, getting my freedom from the pack. It’s so calm, I call the lines into the corners, I set the pace. As I drift back a few rows, Erick Rodas pulls alongside and lets me know he saw me off the front and that I should be wiser with my pennies. Good advice. I ride around with the peleton and conserve. Then I get an email – it’s an eVite from Josh. I didn’t even read it, I figured it’s a party, why not. And just like that I’m in a 3-man break in a Masters 40+ race with a Surf City powerhouse and Velo Pasadena’s Tony Cruz, a National Champ. I look at my Garmin, we have 25 minutes left, ouch. Josh and I work well together and we put the work in to make ground on the peloton. For 24 minutes we pushed hard, taking solid pulls. Unfortunately, Tony did not want to do any work and that was our undoing in the end. We entered the last lap with just 8 seconds on the field. We managed to hold them off for a while, but the Surf City train caught us in the final corner. We did our best to latch on, Josh got 8th, I got 11th, and poor Tony got 65th. Jeepers. That sounds like a call to arms. I fill out a Time-Off request and it gets approved. TELO is ON. I did Big Rock, dirt, and Upper Tuna for breakfast to wake the legs up. Then spent the day hoping that Thomas Rennier would make his flight back from Denver to join me. Unfortunately, his flight was delayed, so off I went without him. TELO is a 1-mile circuit with 6 corners. There’s a brutal headwind, but the course is safe and relatively free of traffic. La Grange lined up about 6 riders at the start. Surf City, Big Orange and Bahati were all well represented. We did the customary first lap in neutral. As we crossed the Start/Finish to start the 2nd lap I was about 20th. The field just ever so slightly parted, like the Red Sea might, and my right hand fell onto the down-shifter. Clunk, clunk, clunk – oh boy I think I just hit the jets. I dove right through the pack, and as I emerged out the front at 33mph as the wind hit my face. I smiled. I like being at front. I like it a lot. As I turned the corner into the direct headwind, I talked myself into a lower, more aero position, I settled in. It’s going to be a long 25 laps, but with every lap I put just a few seconds on the field until I had a 40-second gap. Then the lap cards started coming. At 5 and 4, I believed I could do it. At 3 to go I was convinced there was no way I could finish, let alone at the front. But when I saw 2 to go, and glanced over my shoulder, and saw nobody, I knew I could do it. I buckled down and pushed as hard as I could. It stuck, it finally stuck.